Forget career advice from your boss or the business suit sitting in airline seat 7A. Forget start-up mentors and the advisory board; forget angel investors and analysts with their binders of business suggestions. Forget using your family or local business leaders as a sounding board for your existing (or next) enterprise. Forget the biography of the corporate titan or the entrepreneurial whiz with the obligatory garage. 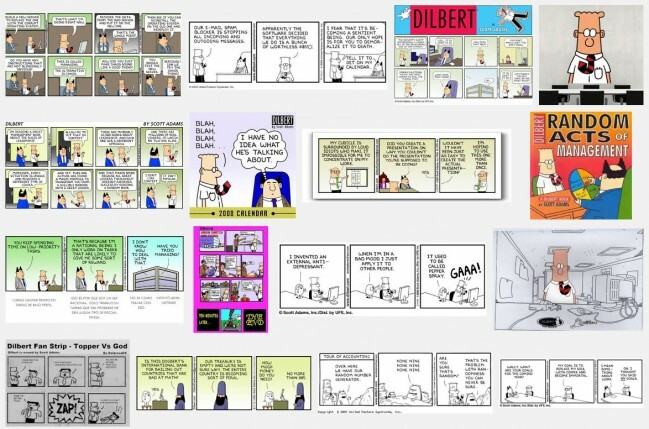 The best career advise comes from one source, Scott Adams: it’s all about failure. Life coach Jayne Morris suggests that de-cluttering your desk, attic or garage can add positive energy to your personal and business life. Morris has coached numerous business leaders and celebrities in the art of clearing clutter. According to a leading expert, having a cluttered environment reflects a cluttered mind and the act of tidying up can help you be more successful. The advice comes from Jayne Morris, the resident “life coach” for NHS Online, who said it is no good just moving the mess around. In order to clear the mind, unwanted items must be thrown away to free your “internal world”, she said. Ms Morris, who claims to have coached celebrities to major business figures, said: “Clearing clutter from your desk has the power to transform you business. “How? Because clutter in your outer environment is the physical manifestation of all the clutter going on inside of you. “Clearing clutter has a ripple effect across your entire life, including your work. She is adamant cleaning up will be a boon even though some of history’s biggest achievers lived and worked in notoriously messy conditions. Churchill was considered untidy from a boy throughout his life, from his office to his artist’s studio, and the lab where Alexander Fleming discovered penicillin was famously dishevelled. Anything that is no longer used should not be put into storage but thrown away completely. Keeping something in the loft, garage or other part of the house, does not help because it is still connected to the person “by tiny energetic cords” she claims. She said: “The things in your life that are useful to you, that add value to your life, that serve a current purpose are charged with positive energy that replenishes you and enriches your life. Briton has long been a nation of hoarders and a survey showed that more than a million are compulsive about their keeping their stuff. Brains scans have also confirmed that victims of hoarding disorder have abnormal activity in regions of the brain involved in decision making – particularly in what to do with objects that belong to them. There is a common urban legend that to be successful in most deeds one needs to be an extrovert. In business, many of us are led to believe that all successful CEOs and corporate-titans are extroverts. We also tend to think that to be a top-flight sales person one also needs to be an out-and-out party-animal. Well it is a myth, now backed up by the most comprehensive meta-study (a study of studies) to date on extroversion and business performance. Spend a day with any leader in any organization, and you’ll quickly discover that the person you’re shadowing, whatever his or her official title or formal position, is actually in sales. These leaders are often pitching customers and clients, of course. But they’re also persuading employees, convincing suppliers, sweet-talking funders or cajoling a board. At the core of their exalted work is a less glamorous truth: Leaders sell. So what kind of personality makes the best salesperson — and therefore, presumably, the most effective leader? Most of us would say extroverts. These wonderfully gregarious folks, we like to think, have the right stuff for the role. They’re at ease in social settings. They know how to strike up conversations. They don’t shrink from making requests. Little wonder, then, that scholars such as Michael Mount of the University of Iowa and others have shown that hiring managers select for this trait when assembling a sales force. The conventional view that extroverts make the finest salespeople is so accepted that we’ve overlooked one teensy flaw: There’s almost no evidence it’s actually true. When social scientists have examined the relationship between extroverted personalities and sales success — that is, how often the cash register rings — they’ve found the link to be, at best, flimsy. For instance, one of the most comprehensive investigations, a meta-analysis of 35 studies of nearly 4,000 salespeople, found that the correlation between extroversion and sales performance was essentially zero (0.07, to be exact). Does this mean instead that introverts, the soft-spoken souls more at home in a study carrel than on a sales call,are more effective? Not at all. The answer, in new research from Adam Grant, the youngest tenured professor at the University of Pennsylvania’s Wharton School of Management, is far more intriguing. In a study that will be published later this year in the journal Psychological Science, Grant collected data from sales representatives at a software company. He began by giving reps an often-used personality assessment that measures introversion and extroversion on a 1-to-7 scale, with 1 being most introverted and 7 being most extroverted. Then he tracked their performance over the next three months. The introverts fared worst; they earned average revenue of $120 per hour. The extroverts performed slightly better, pulling in $125 per hour. But neither did nearly as well as a third group: the ambiverts.